In the previous article (http://ponnadi.blogspot.in/2013/07/anthimopaya-nishtai-13.html), we observed AchArya apachAram in detail and the ill-effects of committing such apachArams. We will continue with understanding bhAgavatha apachAram in this section. Next we shall see bhAgavatha apachAram. ivai onRukkonRu krUrangaLumAy upAya virOthigaLumAy, upEya virOthigaLumAy irukkum. இவை ஒன்றுக்கொன்று க்ரூரங்களுமாய் உபாய விரோதிகளுமாய், உபேய விரோதிகளுமாய் இருக்கும். Simple translation: These (akruthya karaNam - indulging in what is rejected in sAsthram, bhagavath apachAram - committing offense against bhagavAn, bhAgavatha apachAram - committing offense against bhAgavathas, asahya apachAram - committing bhagavath/bhAgavatha apachAram without any specific reason) are more cruel than the preceeding ones (i.e., bhagavath apachAram is more cruel than akruthya karaNam, bhAgavatha apachAram is more cruel than bhagavath apachAram and asahya apachAram is more cruel than bhAgavatha apachAram) and are hurdles in our means and the attainment of the ultimate goal. Simple translation: When am I going to again see that srIrangam which is filled with divine wealth and beauty? The dhivyadhEsam is located close to water sources which have huge trees inside them and that are very pleasing to the mind. The birds are constantly making beautiful sounds which resemble the recitation of vEdham. The path to the dhivyadhEsam is filled with crowds of devotees who are looking out for salvation. Through this slOkam, bhattar reveals his divine suffering in separation from srIranganAthan and srIrangam. At that time, a srIvaishNava approaches bhattar, serves him and requests him to explain thiruviruththam once fully. bhattar turns to his sishya nanjIyar and tells him "jIya! In separation from srIraganAthan and srIrangam, I am unable to talk about anything. You explain the meanings of thiruviruththam to this srIvaishNava" and guides the srIvaishNava to the lotus feet of nanjIyar. As time goes by, vIra sundhara brahma rAyan who offended bhattar eventually dies. Some srIvaishNavas who were taking care of bhattar's mother ANdAL and accepting her guidance, heard this news and started celebrating by throwing their upper cloth up in the air. Seeing this, ANdAL immediately entered her thirumALigai (residence), closed the doors and started crying out loud. The srIvaishNavas who are greatly celebrating turned to ANdAL and asked her "Are you not happy that bhattar's enemy is gone, bhattar will be back here and we will all have great sathsangam?". ANdAL responds "You dont know. vIra sundhara brahma rAyan is a direct sishya of AzhwAn. But he troubled bhattar so much and has committed the greatest of offenses. Not only that, he did not even go back to bhattar and begged for forgiveness saying 'I have done this great mistake. Please forgive me' and bowed at the lotus feet of bhattar. Now he has died too. As soon as he left his body, the servants of yama dharma rAjan have caught him. I am unable to bear that sight of him suffering at the hands of them. None of you can understand this feeling". Thus, my AchAryan (mAmunigaL) says that the result of bhAgavatha apachAram is very cruel. 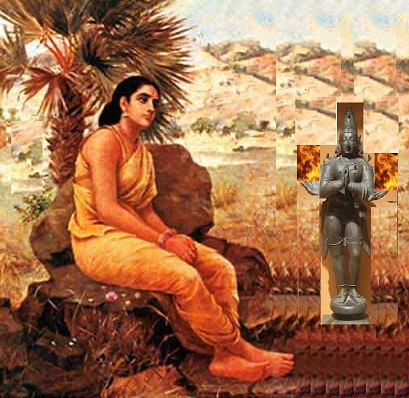 kadakkaththup piLLai who is a sishya of bhattar who lived in chOLa maNdalam (region) hears about sOmAsiyANdAn who was fully trained by udayavar. sOmAsiyANdAn was living in thirunArAyaNapuram and was training many in srIbhAshyam. piLLai goes to thirunArAyaNapuram and seeing him sOmAsiyANdAn becomes very pleased and offers him a place to stay in his own thirumALigai. piLLai then hears srIbhAshyam, bhagavath vishayam, etc for a whole year under the guidance of ANdAn. After the sARRumuRai (final session), piLLai starts his return journey. ANdAn accompanies piLLai to the border of thirunArAyaNapuram (Translator's note: It is customary for srIvaishNavas to give a worthy farewell to visiting srIvaishNavas by accompanying them until they reach the end of the town or so - mainly a water source) and says "I am honoured that you stayed here for a whole year; I am feeling very sad about the separation now; Please bless me with a valuable instruction that I can take refuge on". piLLai responds "sOmAsiyAndAn! You are very knowledgable and have great command over both srIbhAshyam and bhagavath vishayam. Yet, you tie a knot in your upper cloth to constantly remind you about avoid bhAgavatha apachAram". This incident was revealed by my AchAryan (mAmunigaL). (Translator's note: It is customary to tie a knot in the upper cloth - seeing which we will be reminded of something which we may forget). Simple translation: The devotees of the Lord, who seem to resemble humans or devas due to their birth, clan, actions or qualities are indeed equal to the Lord Himself. They must not be abused. They carefully protect the divine lands and temples of the Lord. They are excellent in jnAnam and anuShTAnam. They shine brilliantly as ornaments of the learned. Simple translation: As identified by the learned men, qualifying the divine archA form of emperumAn based on the raw-material and qualifying a vaishNava based on his birth is considered as doubting the chastity of ones own mother. Simple translation: Those who recognize me in archAvathAra but not in my devotees, hurt me with the might of poison, fire and weapons. Simple translation: My love for My devotees is ever increasing, so much so that it would go to the extent of destroying the whole world if they are disrespected. Simple translation: Those men who censure my devotee, even a chaNdAla, are never forgiven by me even after the passage of several millions of years. Simple translation: An intelligent man shall not humiliate my devotee even if he is a chaNdAla, for he will certainly fall into the hell of raurava for humiliating my devotee. Simple translation: They, who have hatred towards vaishNavas, are certainly not redeemed even by a thousand asvamEdha yAgams or a hundred vAjapEya yAgams. Simple translation: He, who sees the devotee of bhagavAn by the discrimination of birth such as shUdra, nishAdha or svapacha, attains the treacherous hell. Simple translation: The one who is well versed in vEdhams, who censures my devotees as being without discipline, righteousness or knowledge, verily attains the character of a chaNdAla. Simple translation: Even if one commits the most improper deeds, if he is my devotee, he is to be considered saintly. Simple translation: He, who is possessed of all good qualities and is disciplined in all acts of righteousness, is still banished to the far lands if he is a hater of the devotees of bhagavAn. Simple translation: Dear srIranganAtha! Even brAhmaNas who are leaders among vaishNavas and expert in 4 vEdhams and their 6 angams (supplements), when they offend your devotee, immediately, right there, they will become very lowly. Simple translation: nanjIyar highlights that bhagavAn appeared and performed so many difficult tasks because he was unable to bear bhAgavathas being offended. Simple translation: bhAgavatha apachAram is of many types. Qualifying them by their birth is one of them. This is more cruel than qualifying the divine archA form of emperumAn based on the raw-material that is made of. According to sAsthram, qualifying the divine archA form of emperumAn is compared to doubting the chastity ones own mother. Simple translation: For one who commits bhAgavatha apachAram, just like thrisangu who became karma chaNdAlan (a person becoming chaNdAla due to their action right in this birth), the yagyOpavItham itself will become the rope that tightens the neck and chokes him. jAthi chaNdAlanukkuk kAlAntharaththilE bhAgavathanAgaikku yOgyathai uNdu; athuvumillai ivanukku; ArUda pathithanAkaiyAlE. ஜாதி சண்டாலனுக்குக் காலாந்தரத்திலே பாகவதனாகைக்கு யோக்யதை உண்டு; அதுவுமில்லை இவனுக்கு; ஆரூட பதிதனாகையாலே. Simple translation: For a chaNdAla who is born in that birth, at some point, there is a possibility to become a bhAgavatha. But for karma chaNdAla, there is no such hope since he fell from a very high position. Since AzhwArs who are the leaders of our society, glorify srIvaishNavas greatly, for a srIvaishNava, just considering another srIvaishNava equal to them itself is a bhAgavatha apachAram. 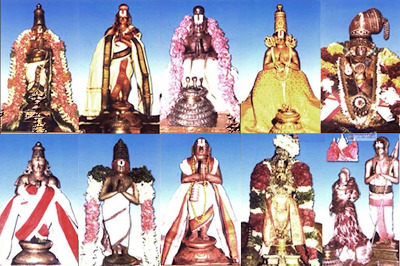 More pramANams are shown that highlights the ill-effects of bhAgavatha apachAram. Simple translation: glorifying the one who is situated in knowledge about brahmam (Meaning is not completely clear). Simple translation: I do not fear of the wrath of Indhra's vajra or the servants of Yama or the fury of fire, moon, fire and other dhEvathas. But I greatly fear bhAgavatha apachAram. Simple translation: Comparison of the one situated in knowledge about brahmam (Meaning is not completely clear). Simple translation: The longevity, wealth, merit, honour, property, goodness and everything favourable to him are destroyed of the man who commits the greatest transgression (of bhAgavatha apachAram). Simple translation:The people, who condemn the devotees who always think of bhagavAn's lotus feet as the repository of all blemishes, lose their fame, wealth, longevity, children, relatives, friends and possessions. Simple translation: Those hypocrites shall not receive bhagavAn's grace who worship Govinda but not his devotees. Just like, relationship with a pure bhAgavatha itself is sufficient (even without gyAnam-knowledge and anushtAnam-practice on our part) to attain the most blissful result, just committing apachAram towards such bhAgavathas itself is sufficient to give up the same even if we had full gyAnam and anushtAnam. Simple translation: He, who listens to the censure of vaishNavas, has his ears filled with spears and arrows. Simple translation: To understand this (the cruelty of bhAgavathapachAram), meditate on the vainadhEya incident (where garudan just thinks why chANdili is living in a remote place instead of dhivyadhEsam and immediately his wings got burnt) and AzhwAn's instructions to piLLaippiLLai AzhwAn on giving up bhAgavatha apachAram. Thus, the most cruel nature of AchArya apachAram and bhAgavatha apachAram is explained by vEdha sAsthram, purANam, etc., and the all-knowing AzhwArs who have understood the essence of those sAsthram and our AchAryas several times in the same way. 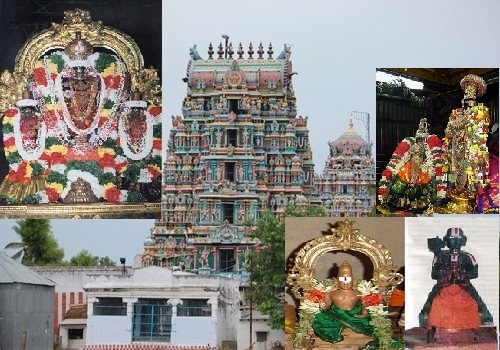 Understanding that, an Asthika (one who is faithful to sAthram) who is focussed on being relieved from this samsAram should never indulge in any committing apachArams any where (not even in their dreams) towards bhAgavathas who are the most apt masters and the ones who can give full protection at all times for him. Our jIyar (mAmunigaL) often says, if one forgets these matters and commit even a small apachAram it is irrepairable just like, if the land splits it cannot be joined, if the sea enters land no one can stop that and if a mountain falls on the head we cannot bear it - bhAgavatha apachAram is such irresponsible deed which has no act of reversal for the offense. Thus, one should carefully deal with bhAgavathas who are as good as their own sadhAchAryan, without forgetting these principles, avoid any apachArams. Not only that, the attitude of such sathsishyas towards their AchAryan and those bhAgavathas are explained further. Translator's note: Thus, we have seen the ill-effects of committing bhAgavatha apachAram. In the next section we will see what is to be done/pursued by a true sishya with respect to AchAryan and such great bhAgavathas.